Are you trading with a TREND? To be consistantly profitable in Forex, traders should be able to identify market trends. Why do you need to know about trends in Forex? The answer is simple: when you know trend direction you can increase your chances to profit from a market move by opening a position in the direction of the trend. Counter trend traders can be often punished by the Forex market. How to spot a trend? Any novice trader should be able to see simple slopes and hills on the chart created by the market price, a trained trader is able to see certain chart patterns. When the market moves it does so in a certain way, creating a pattern — a set of waves. The price makes peaks and valleys, or they are also called Tops and Bottoms. 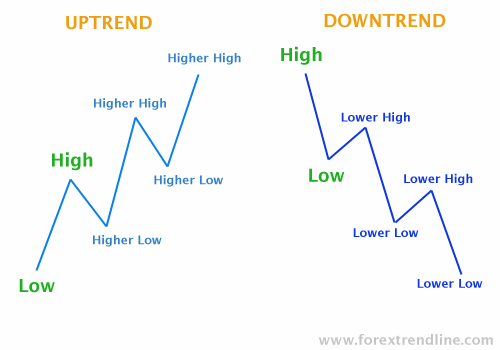 Higher tops and higher bottoms will tell Forex trader that uptrend is in place. On the contrary, lower tops and lower bottoms suggest a downtrend. A good clean trend in a well trending market is one of the favorite trading environments for all Forex traders to trade in. If you ask an experienced trader how he plans his trading session, the answer will be: "I open my charts and the first thing I want to know is Where the trend is going". That's right, the examination of the market trends is what every analyst do daily. 1) Visual, where you zoom out the charts till you can see price direction clearly. 2) By using indicators. Forex example, 200 SMA. If the market is trading above 200 SMA — that's a bullish market, everything below 200 SMA indicates bearish trend. 3) By using other trend following indicators. 4) Or by drawing trend lines! Simpy connet lower lows on your chart till you have a good visible trend line. Then do the same for higher highs. What you'll get will be either a channel Up or a channel Down. Now it's easy to tell which direction the price is heading. 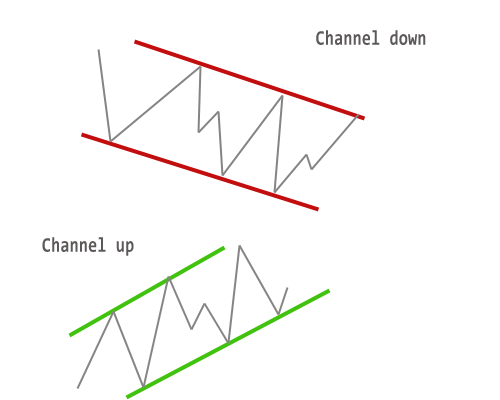 If you don't see any channels, then it's probably a range bound market.